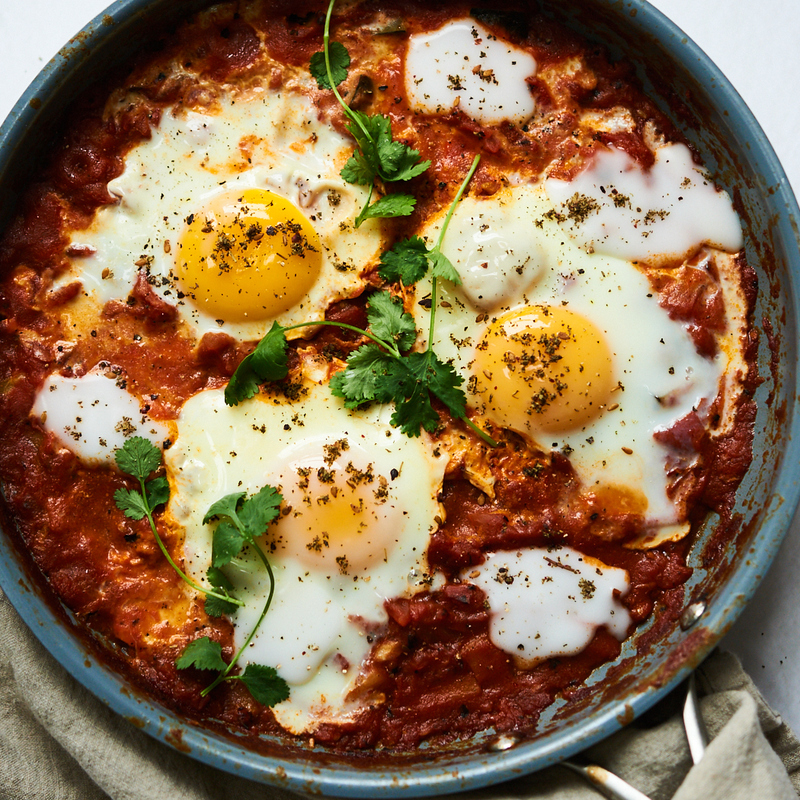 Shakshuka is such a warming, comforting and filling recipe for breakfast, that also works as a cozy dinner option. Simmered tomatoes with spices is the perfect complement to gently cooked eggs, especially when you mix in some tart yogurt. We’ve used dairy-free coconut yogurt in this recipe, but you can use any type of yogurt that you like. In this version of shakshuka we chose to add in turnip and zucchini for an extra serving of veggies, reminiscent of a tagine. You could even add in other veggies that you like, such as carrot, butternut squash and some leafy greens. We like to add in dallops of yogurt right before serving to add some good probiotics into this dish. The bacteria, naturally found in yogurt, supports the balance of good bacteria in the digestive tract. Not only is this good for your digestion and your immune system, but studies have also found that including probiotics in the diet can help improve brain function and mental health. 1. Heat some extra virgin olive oil in a skillet. 2. Add the garlic, turnip and zucchini and saute for about 5 minutes. 3. Then add in the fire roasted tomatoes, coriander, cumin, paprika, sea salt and pepper. 4. Simmer for around 20 minutes until the veggies are tender. 5. Use a large spoon to create 3 to 4 shallow dips in the tomato mixture. 6. Crack an egg into each dip. 7. Continue to simmer for another 10 minutes, or until the whites of the egg are cooked. You can place a large lid over top of the skillet to help speed up the cooking time. 8. Once the eggs are cooked to your liking (we usually like to keep the yolks runny), turn off the heat. Sprinkle chopped cilantro over top (or sub in mint or basil instead). 9. Add several dallops of yogurt over top of the tomato sauce. 10. Lastly, sprinkle za’atar over top and black pepper right before serving.